Recently, Carl Trueman and Liam Goligher have published a series of very serious accusations against those who affirm an eternal relation of authority and submission among the Trinitarian persons. Goligher in particular says that the view is heresy and idolatry. He identifies Wayne Grudem by name as guilty of this supposed error, but of course the accusation implicates Bruce Ware and a host of others who hold to this view as well (including yours truly). Today, both Wayne Grudem and Bruce Ware have issued very helpful responses to these “false” and “intemperate accusations” of heterodoxy. I recommend that you read both of them. They prove that the accusations leveled by Trueman and Goligher are unwarranted and misleading. They also show that Trueman and Goligher have misrepresented the view held by Grudem and Ware. 1. The idea that Wayne Grudem and Bruce Ware are promoting an idolatrous, heterodox view of God is absurd. Grudem’s and Ware’s articles show that as do their many years of published works. 2. Trueman acts as if the eternal submission of the Son to the Father view is some new teaching that has been sneaked into the back door of the church while no one was looking. This too is absurd. These conversations have been going on in public for over two decades now. The conversation among evanglicals long predates the so-called “new Calvinist” movement that Trueman seems so alarmed about. And if Grudem is correct, the eternal submission of the Son to the Father view itself is no historical novelty. 3. I agree with Truman and Goligher that when it comes to the doctrine of the Trinity and gender roles, we don’t want the tail to wag the dog. In other words, it would be wrong to revise the orthodox doctrine of the Trinity in order to promote some other social agenda. But that is not what this conversation is about. It’s certainly not the aim of leading proponents of the eternal submission of the Son to the Father view. As Fred Sanders has pointed out concerning Ware’s writings in particular, “It’s always been abundantly clear that he is far more passionate about the Trinity for its own sake.” So the broad accusation that this view is somehow owing to some ulterior motive is also false—at least for leading proponents of the view. 4. Truman and Goligher write as if any analogy of gender roles to intra-Trinitarian roles is inappropriate and unbiblical. Goligher writes, “To use the intra-Trinitarian relations as a social model is neither biblical nor orthodox.” Likewise Trueman, “Analogies of intratrinitarian relations to human notions of submission [are] inappropriate.” The problem with these two statements is that they fail to recognize that Scripture itself makes the analogy! The Apostle Paul writes, “But I want you to understand that Christ is the head of every man, and the man is the head of a woman, and God is the head of Christ” (1 Cor. 11:3). The point is clear. The headship of God is in some sense analogous to that of man. The nature and extent of the analogy is certainly up for discussion and debate. But to pretend that some form of analogy is unbiblical is untenable—unless of course we dismiss the apostle Paul, but I don’t think either side of this debate wants to do that. Even Millard Erickson recognizes that this text seems to support the Son’s eternal submission to the Father (pp. 114-15). And at the end of the day, he’s not sure how to make this verse fit within his own view of the Trinity (p. 248). The text is just sort of left hanging out there as an inexplicable anomaly that doesn’t have to be accounted for. I’m wondering if Trueman and Goligher would take a similar approach. I’m sure they wouldn’t accuse Paul of Arianism or Tritheism. So how do they deal with the fact that the text indicates that the “Son” submits to the Father in some sense in eternity future? This of course suggests that the Son’s submission is not temporary. I could mention other texts implicating eternity past (e.g., Phil. 2:6), but I’ll leave it there for now. Actually, this isn’t accurate either. We didn’t hear the accusation from him first. We first heard it from egalitarians who have been using this tactic for many years now in an open attempt to discredit complementarians. It hasn’t worked for them. I’m hoping that it doesn’t work for Trueman and Goligher either. Indeed in private conversation, Grudem has told me that he does not reject eternal generation so long as it is explained biblically in terms of “eternal personal differences” (see Systematic Theology, p. 1234). It seems to me that Swain and Allen’s work helps to clarify the connections between eternal generation and the “eternal personal differences” that Grudem refers to. If you accept the usual scriptural proofs for eternal generation (as I do), this clarification is a helpful one indeed. What’s eternal, and essential to the divine being, is Sonship, which means eternal generation and the filial generatedness that it entails. Is the obedience of the Son’s will to the Father’s commanding authority also eternal? That seems to me to be a fairly small question, and also one that needs an answer so nuanced it’s practically a change of subject. This is another way of saying (I think) what Swain and Allen said in the article I wrote about yesterday. It also happens to be the perspective reflected in some of the essays in the book. I think there is much more common ground here than some of the recent controversy would indicate. I hope parties to this debate will see that (Psalm 133:1). 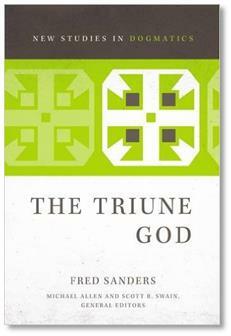 Sanders has an important volume forthcoming from Zondervan on the Trinity: The Triune God. The release date is December 6, but it is available for pre-order now. What is Goligher concerned about here? Other seemingly orthodox evangelical theologians deny the eternal generation of the Son (i.e., John Feinberg in his book “No One Like Him” pp. 488-489.
now I myself confess eternal generation of Son or as I would prefer to rather express it – generation of Son in timeless eternity. Still let me furnish one more example of a famous reformed theologian who rejected eternal generation of Son and that being great Presbyterian systematic theologian Dr. Robert Reymond who is now with the Lord. His two works where he is addressing this theme and rejecting eternal generation are “A New Systematic Theology of the Christian Faith” and “What Is God? : An investigation of the perfections of God’s nature”. So if pastor Liam Goligher wants to be consistent, he also needs to point his finger at a fellow Presbyterian theologian and that even being such a great one as Dr. Robert Reymond. I’m with you and Grudem and Ware. At least “some” form of submission is required by the text of Scripture. I also find the distinction between an ontological equality and a functional hierarchy within and between the members of the Trinity helpful in explaining the limits of any such “submission” of the Son to the Father. In other words, the distinction between the members of the Trinity is such as to create a hierarchical relationship between the members of the Trinity. But this hierarchical relationship is not such as to undermine or destroy the perfect equality that has eternally existed between the members of the Trinity. While there may not be any perfect analogy “to” the Trinity, we are, as you say, warranted in drawing an analogy “from” the Trinity (as in the complementation debate). The PCA holds its General Assembly soon. It should take this issue up, seeing how influential these two are in this realm. Trueman isn’t PCA. He is OPC. The ancient church made a distinction between “theology” and the “economy,” the former being God apart from the incarnation and the latter referring to the incarnate Son and his “the Father is greater than I” and “I do only what I see my Father doing.” I don’t see any reason to abandon this distinction. See my recent book on John of Damascus; it might help. Dr. Twombly, would you agree that God relates to creation the way that He does because of the way God is apart from creation or would you assert that God in relation to creation tells us nothing about God as He is apart from creation? Hermona, big question! Not sure I know enough to say much. I’m inclined to go with the Greek fathers (broadly speaking) and embrace the first option. With Greg Nyssa, I’d affirm that “the works of the Trinity are one” (as in plausibly Genesis 1:1-3); but when we speak of the “economia.” it seems each person of the Trinity has separate tasks. Sorry for hasty words. My book is more nuanced. Happy to hear your take. I agree with the doctrine of inseparable operations and don’t see that it is necessary to reject it in order to defend Ware or Grudem like claims concerning the Trinity. I just heard about this and read the articles from Trueman and Goligher, as well as the responses from Ware and Grudem. I’m stunned that Trueman would write something like that (I don’t know anything about Goligher). And I’m impressed at the restraint shown by Ware and Grudem in their responses. 1. As far as I’m aware, complementarianism has never been grounded in any specific view of the Trinity, but rather the creation order and clear commands of Scripture. 2. The only time I’ve ever heard eternal submission raised in the context of complementarianism is to answer the egalitarian objection that to have a subordinate role is necessarily to have a subordinate status, or be an inferior being. 4. If we were to read Trueman and Goligher with the same amount of charity and nuance they showed to Grudem and Ware, we could easily condemn them as Unitarians. These three articles would have been sad coming from a first year seminary student. From men of the stature of Trueman and Goligher it is utterly outrageous. I’m looking forward to seeing how they respond to the responses, and hope it is with humility and repentance. Nathan, your first observation is correct, yet it is adverse to the position of Dr. Ware and Dr. Grudem which you say you claim. It would be helpful to define Dr. Trueman’s definition of heresy, in which he often quotes Cardinal Newman, “All heresy is merely orthodoxy stretched at the expense of everything else.” That is clearly the case here. You have an orthodox position of complementarianism stretched to the detriment of the ontological trinity itself. The CBMW since their founding has on multiple occasions attempted to tie their position on gender roles to a first tier issue in hopes of trumpeting their cause against liberalism. I applaud this effort, yet I would suggest that a historic confession, that you could confidently operate within the bounds of would be far more suitable than taking defensive and reactionary theological measures every time secular culture challenges your third tier view of gender roles. Just as Nathan said, I look forward to the response from Dr. Trueman and Goligher and I know their rebuttals will be made with humility. Thank you, Nathan, for your response. I wish to ask, though: of what do you believe Drs. Trueman and Goligher need to “repent”? Would it not as easily be said that, according to those who agree with Trueman and Goligher, that Drs. Ware and Grudem should respond with “humility and repentance”? Goligher and Trueman seem to be taking their tactical cues from the LGBT folks. (1) Proffer a distorted picture of your opponents’ position. (2) Take what was considered true from ages past up till yesterday and label it nearly damnable heresy today. This whole trinity thing has bugged me since I became a Christian in 1981. And every article I’ve seen trying to defend it looks like a lot of pontificating on something the bible does not really say, so they attempt to demonstrate, through a lot of words, how it is what the bible teaches. Meanwhile, Jesus makes it ABUNDANTLY clear that he is subordinate to the Father. And when he says “I and the father are one” it is like me saying my wife and I are one. And God refers to “himself” as “we” in Genesis. Bottom line for me is that I avoid the label and just say Jesus is who he says he is in the bible, and God the father likewise. Thank you. I am a bit confused myself. In light of Deuteronomy 29:29, why is all this a point of speculative discussion – and now argument – in the first place? I think one of the practical challenges is around your point #4 in regards to the proposed “eternal submission” and how that infers that complementarian views of gender roles is the best understanding of the biblical data. The point only works if kephale (“head”) is understood from a complementarian perspective. The question is: Does kephale refer to “authority” (and therefore subsequently refer to “submission”) or does it refer to “source” (i.e., God is the source of Christ). It’s a tall order to make one verse about a proposed eternal subordinationism within the Trinity as a major reasoning for complementarian perspectives. I’m not saying that complementarians see this as their only argument. But as one argument, it is one of which I think is a tall order to convince. DENNY, thank you for your sensitive comments on Twitter about the terror attack in Orlando. I’ll let the Fathers, the Councils and Creeds sort out the issues both sides have raised here regarding the Trinity. The problem is that this is the wrong way to defend Complementarianism. And that is so whether you think it applies to only home and Church or includes all of life. The correct way to illustrate, defend, define relationships between men and women is to recognize that the priest functions as an icon of Christ (male) and the Church is His Bride (female). Intratrinitarian relations, whichever party is right here, are NOT instructive for male-female relationships whether in marriage, the Church, or society at large. And yes, if these things, sometimes called the creation order, matter at all, they matter everywhere. Ware is a gifted exegete and theologian. He may well be. But he’s not infallible. Kamilla, when eGals hold that any form of submission among those who are essentially equals is unacceptable, the intratrinitarian relationship becomes very instructive. Not in the same way as a Christ and the church sort of way, but in a greater to lesser sense. Yes, I tweeted that one over the weekend. Very good article. Essentially, I think it is almost irresponsible to claim that EFS/ESS adherents are outside of orthodoxy and putting others in dangers of apostasy.